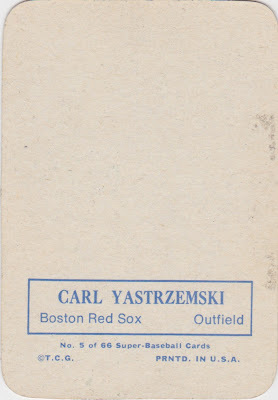 This week in 1983, Carl Yastrzemski hit his final career homer, a 2-run shot off Cleveland's Rick Sutcliffe. The Red Sox chased Sutcliffe from the game early, but--as with so many of that year's contests--let their lead slip away and lost 8-6. Boston finished a mediocre 6th in the division, as Cal Ripken and Eddie Murray powered Baltimore to both AL East and World Series titles. Thanks to 23 years (!) in Boston, Yaz holds the games record for one-franchise players (3308) and is second all-time to Pete Rose (3562). Today's post has special relevance to modern sets as the progenitor of glossy, high-quality photos on thicker, better-than-cardboard stock. 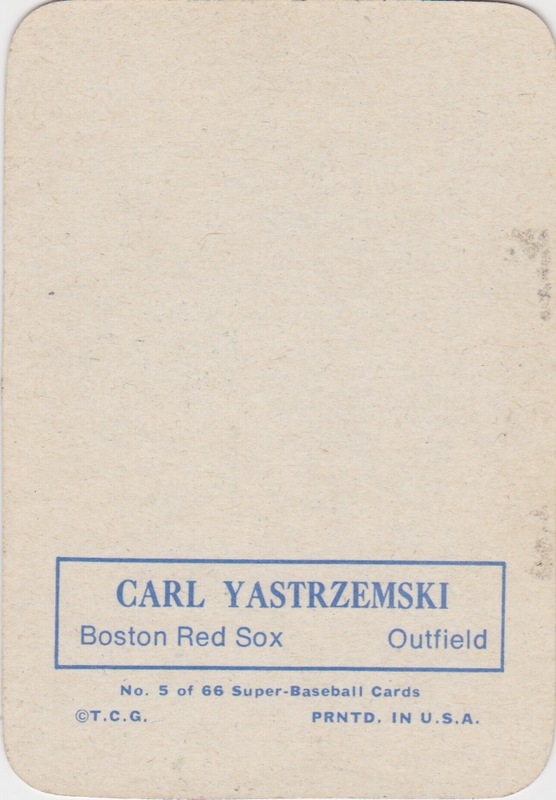 Topps turned 1960s printing technology advances into a multitude of limited-run "test issues," creations similar to those published as inserts and parallels today. (More about these "tests" at OldBaseball.com.) My own #5 lost some paper from the front--I buy affordable--but still stands out as a sharp picture and distinctive design for its era. Topps editors pulled out all the stops in 1969, shipping 8 different sets to some part of North America. Looking to catch all 66 Super cards? It's possible for patient collectors who can invest $1000+ in a set. I've been working on a low-grade version for 8+ years and need about 10 more, mostly HOFers. Set your sights on the star-filled checklist, if you feel lucky. Value: Super Baseball's sharp look and limited availability make it pricy to modern collectors. 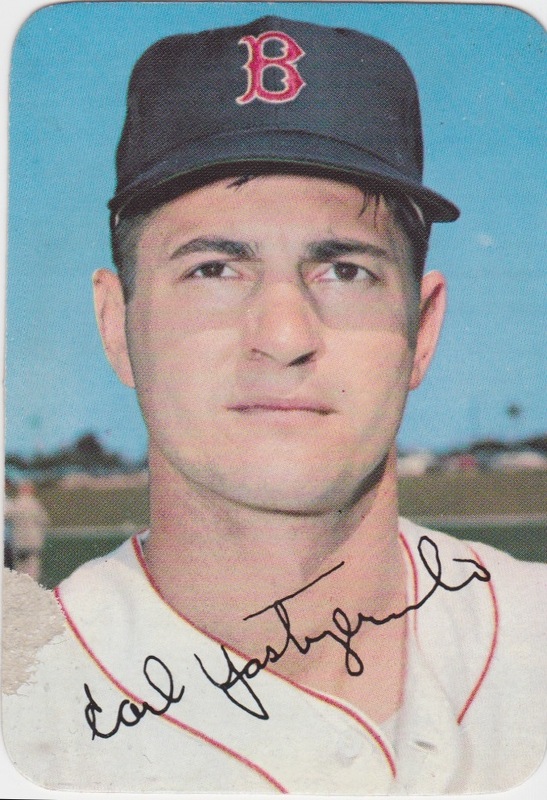 This Yaz was $50, even with paper missing. Lesser-known players run $10-20 in low grade, but superstars like Clemente and Mantle cost hundreds more. Fakes / reprints: Haven't seen any in the marketplace, in part because many dealers slab all of their Supers, which would (hopefully) catch the bad ones. Type collection count: This post marks #700 on the blog; thanks to all who've read this far. Only 14 away from Babe Ruth! Nice card and congrats on #700!!! Make sure you celebrate when you hit #756, too. (No need to celebrate for #763).